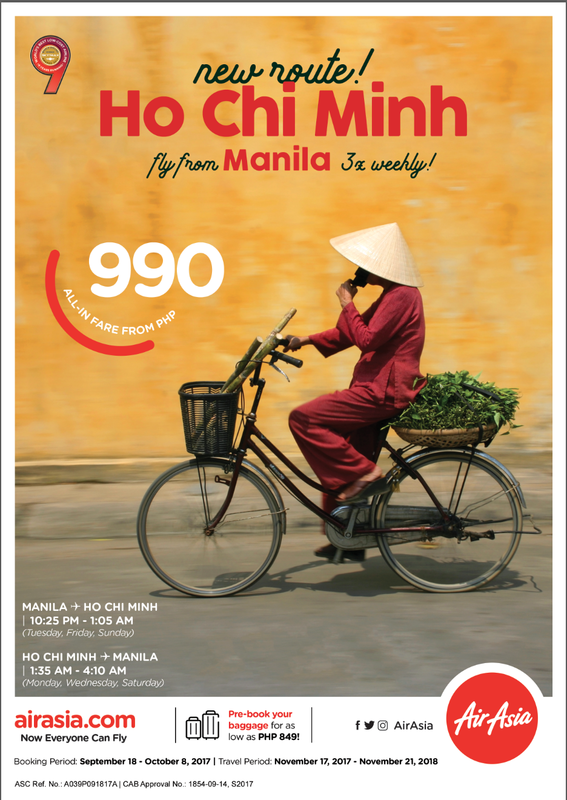 MANILA, 19 September 2017 -- AirAsia is introducing direct flights from Manila to one of the most vibrant and biggest cities of Vietnam, Ho Chi Minh City, further strengthening the airline’s commitment as an Asean carrier. “AirAsia is the only airline that directly services all ten Asean countries with established operations in the Philippines, Thailand, Indonesia, and Malaysia. Last year, the AirAsia Group carried 13.4 million people within Asean and we aim to continue bringing the region closer together via inter-Asean connectivity,” Comendador added. AirAsia has been recently recognized for its outstanding performance in the Asean priority integration sector for tourism at the ASEAN Business Awards 2017 held in Manila with Philippine President Rodrigo Duterte personally giving the award to AirAsia Group CEO Tony Fernandes and 11 other winners from different sectors last September 6. AirAsia services Manila – Ho Chi Minh route with three flights weekly or every Tuesday, Friday, and Sunday. Vietnam offers travellers an opportunity to discover the country’s tradition that overlaps with French colonial influences and picturesque coastline. A visit first to Ho Chi Minh City (formerly known as ‘Saigon’), is the perfect starting point to explore southern Vietnam. This vibrant city is the centre of commerce and to get a good glimpse of its beauty, it is advisable to seat at a roadside café with a cup of Vietnamese iced coffee or ‘Ca Phe Sua Da’ followed by a stroll to famous architectural marvels such as the Notre Dame Cathedral, Saigon Opera House, Jade Emperor Pagoda and temples. To appreciate the local culture, travellers can sample a myriad of fresh produce and food offerings from Ba Chieu Market, a local market off the beaten path for the famous baguette sandwich, ‘Banh Mi’ or some ‘Com Tam’, a ‘broken rice’ style dish topped with grilled meat; or go shopping for various types of quality fabric at affordable prices at the famed Ben Thanh Market. If you have an interest in history, visit The War Remnants museum or the famed Cu Chi tunnels for a glimpse into what life was during the war.